Trust is a crucial facet of social functioning that feeds into our relationships with individuals, groups, and organisations. The Psychology of Interpersonal Trust: Theory and Research examines existing theories, frameworks and models of trust as well as the methods and designs for examining it. 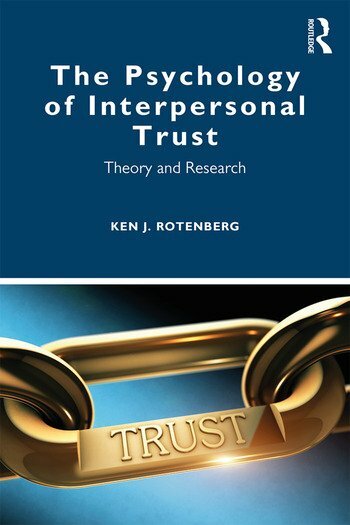 To fully examine how interpersonal trust impacts our lives, Rotenberg reviews the many essential topics trust relates to, including close relationships, trust games, behavioural trust, and trust development. Designed to encourage researchers to recognize the links between different approaches to trust, this book begins with an overview of the different approaches to interpersonal trust and a description of the methods used to investigate it. Following on from this, each chapter introduces a new subtopic or context, including lying, adjustment, socialization, social media, politics and health. Each subtopic begins with a short monologue (to provide a personal perspective) and covers basic theory and research. Rotenberg’s applied focus demonstrates the relevance of interpersonal trust and highlights the issues and problems people face in contemporary society. This is essential reading for students, researchers, and academics in social psychology, especially those with a specific interest in the concept of trust. Professor Ken J. Rotenberg has been an active researcher for over 40 years in the field of Psychology including the sub-disciplines of social psychology, clinical psychology, educational psychology, and developmental psychology. The majority of his over 100 papers have examined interpersonal trust across the life span and trust within social, health, legal and political contexts.